The Internet: It's More Tangled Than You Think | OhGizmo! Metaphorically, the internet may be a series of tubes. But in reality, it’s a bundle of wires. Wired (heh) got a look inside the world’s densest Meet Me Room at One Wilshire Boulevard in downtown LA. If somebody were to trip over an extension cord in this room, “most of California and parts of the rest of the world [including most of the Pacific Rim] would not be able to connect to the internet.” A Meet Me Room connects (among other things) different internet service providers to each other… If it weren’t for rooms like these, you’d only be able to view sites hosted by your ISP. 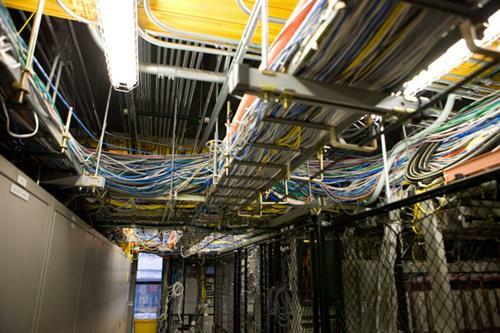 This room interconnects over 260 ISPs, and that means a lot of cables, and a major headache for the poor guy who has to keep track of them all. why not title the article, If you’d like to cripple the internet, attack here. You know, I was sorta struck by the same thing when I read the Wired article. They almost, but not quite, go out of their way to mention where exactly you can find this room. But that’s part of what I thought was neat: you don’t really think about the internet as being so dependent on a bunch of wiring in somebody’s basement.